The La Crosse Storytelling Festival was first conceived in 2003 by two local attorneys, Keith Belzer and Ted Skemp. Through their efforts and backing, the first 3 Festivals took place at Pettibone Park in La Crosse. It was in these first years that groundwork was lain for all following Festivals: the Festival would be first and foremost a family event, the level of National talent would be of the highest caliber, the Festival would highlight professional local tellers, and the event would serve as a way to educate the general public about storytelling. In 2006, the Bluff Country Tale Spinners storytelling guild took on the major responsibility for the La Crosse Storytelling Festival. 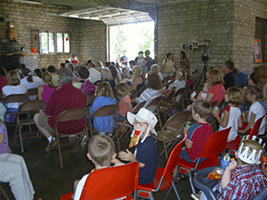 And, as Wisconsin’s Only Storytelling Festival, it continues to meet the initial objectives. Come and enjoy the magic of storytelling! 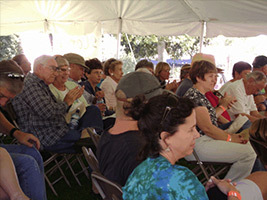 It is the mission of the La Crosse Storytelling Festival to be the premier storytelling event in the upper Midwest, celebrating the art of storytelling by edifying, educating, and entertaining people of all ages and walks of life.